When life gives you lemons you have a drink.... BUT.. when life gives you sticks???? You decorate your mantel. Thanks Gus! A little DT birdie seems to like it. Im lovin' how this is turning out... for once this mantel is NOT giving me grief. I use pretty much anything I can get my hands on. See this very old green pot. It belonged to my Maw Maw... Yep, just add that too! I know I always say less is best.. Guess you can never have too much fall. I need a favor from all of you great blog gal's out there. I know yall are about sick of hearing about these storms. I am too! But please would you join me and send a few prayers out to my Texas friends... They are in Ike's path. We just may dodge this one but so many of my dear friends as well as some of yours Im sure live in that great state of Texas... So lets get em' good and prayed up! Thanks... yall rock! Hello, Susie! 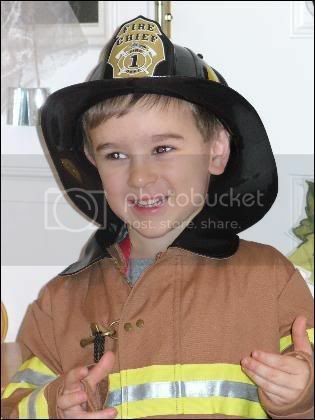 I just recently found your blog - wish I had known to pray specifically for you before Gus. I love how you deal with all the chaos. I especially love how you made a gorgeous mantlescape out of your sticks - what a beautiful testimony! Thanks for all the inspiration you provide in so many ways! 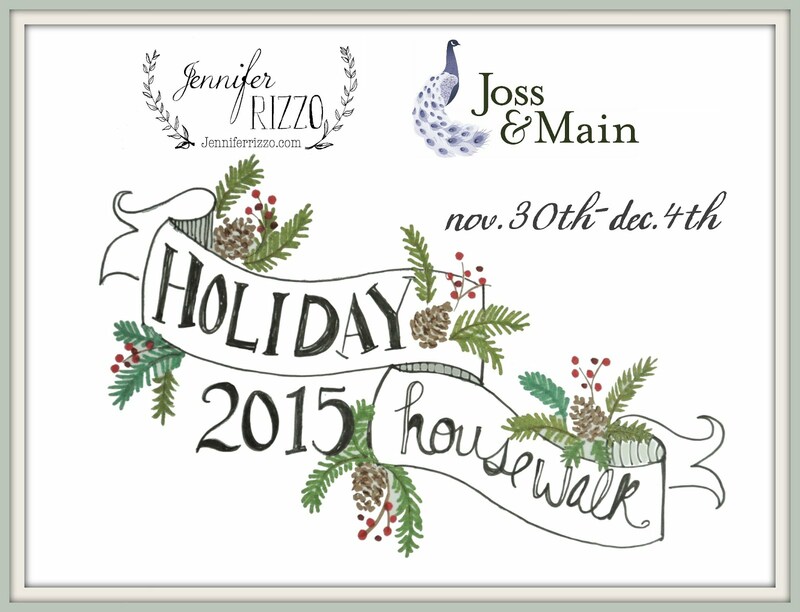 I have added you to my blogroll! I will definitely keep our Texas friends on my prayer list. Hi Susie, I have become a regular reader of your blog after purchasing two of your awesome tassels. 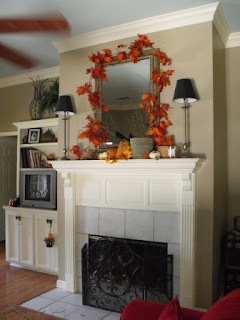 I love what you did with this mantel! I have aso added you to my blogroll. Your mantle looks AWESOME...but hey, would I expect anything else?!?! 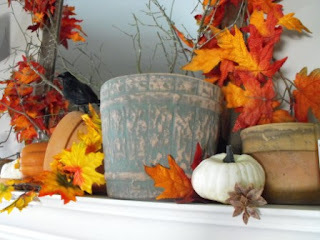 I like those terra cotta pots in there too....I have a bunch of those and those look too cute! 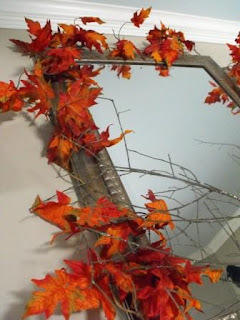 The sticks and fall leaves are great decorating the mirror and mantle. My parents are in the Houston area so they are watching and deciding whether to get the heck outta dodge!! Prayers are going up for those along the Galveston (leave Shelia - Note Songs!! ), Corpus Christi area. Hey Susie, so glad you're back and writing again, and of course sharing again. Love the way your mantle turned out. How simple, who would have thought to use terracotta pots, leaves and pumpkins, but it all works. Really nice job. Sending out prayers to those on the coast. We already have warnings out for our area and we are up in north Texas. They are saying we will have hurricane force winds Sat. night and isolated tornadoes. GREAT!!! Anyway, glad you're going to miss out on this one. Take care. And Hubs and I have already been thinking about Texas, thankful LA isn't in the path this time. Your mantel looks great! I spray painted sticks black yesterday and started my crow tree. I sat on the couch last night and looked at my Halloween stuff I had put out and wanted to take it all down. lol I don't want to get sick of it before Halloween actually arrives. In 2.5 months! Anyway, you really have the art of arranging... something I'm missing. Beautiful! I LOVE YOUR IDEAS!! YOU INSPIRE ME. I ALSO WANT TO THANK YOU FOR STOPPING BY MY BLOG AND LEAVING A COMMENT.COME BACK BY AND SEE ME SOMETIME. Your mantle is so cute. 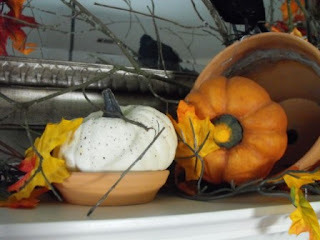 I love the overturned pot with the pumpkin spilling out. Oh I wish I had a mantle now. Very pretty! I really like the the sticks and leaves around the mirror. It looks great! I'm so glad that your back and blogging again. I missed you during the evacuation! Hi Susie! 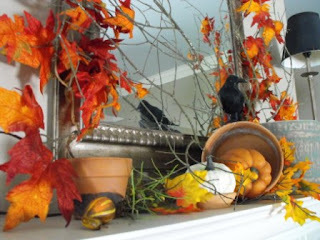 I really enjoy your blog and the mantle looks great. Prayers are coming your way. I love it Susie! It looks beautiful. I love this time of year. Girl that looks so good! Sorry I didn't get her yesterday I was so busy! Thanks for sharing, I went and bought the kids some fall so to decorate they are so excited! Much Love! So pretty!! It all looks so great. I love the look of the sticks and terra cotta pots. Love it! Are those real sticks and leaves?? I thought that was a great urban legend....that leaves turn colors other than from green to brown. ;) Like they do here. ha! Looks great girl! I'm in the DFW area, and we've had rain the past few days. I told my husband that we *have* to get on our rain barrel project (that's been in the works for oh, a year or two) TODAY! I guess we are going to be getting more rain this weekend. We vacation in Port Aransas every year (an island off Corpus Christi) and I'm keeping watch on the web cams. Saw the loooong ferry line filled with cars, trucks, campers, everyone! I hope everyone fares well in this storm! And I hope they are letting people take their pets with them!!! This looks lovely. Can't wait for fall weather. That looks fantastic--love the pots spilling pumpkins. I am glad you will be spared this time and will surely pray for Texas. In addition to our blogger friends, my husband has some family that lives there. Michael is doing well these days. Thanks for keeping him in your thoughts and prayers. BTW - your mantel is perfect! Very cute, Ms. Susie! You did a great job with it. Oh, Susie, I am so loving it and less definitely is not more in this situation. Great job!!! 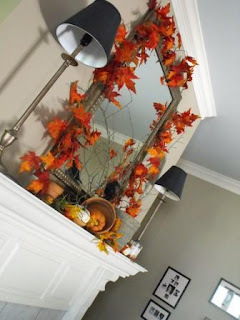 Love the Fall themed mantle. I saw some branches outside with little orange berries on them...I may have to go get some clippings now that I've been inspired by your post. I'm having a GIVEAWAY over at my blog if you'd like to check it out! Your blog always inspires. Thank you! Really cute mantle! Love the combination of stuff...works really well! Will definitely keep Texas in our prayers at this house. Your house is looking so pretty for fall. I love the pumpkins under the glass dome for your table setting... very nice! Hi Susie, I love the addition of the pots, it works and I think it's a little unexpected. I am ALREADY praying for people in the Great state of Texas......we have some good, good, friends in Ike's pathway as well and since we have just been through it with Gustav.......I HATE to think of them going through this as well. I can't get back into decorating right now......I'm still too exhausted and busy with all the stuff to do here yet due to our storm. We have so many people we are trying to help out. It's all good though. I guess my "Fall decorating" will have to wait until we get back from NYC.....which is okay. Unless I get some weird sudden burst of decorating energy before then. Reading your blog gives me some temporary "bliss." I love this Susie! Very pretty mantel. 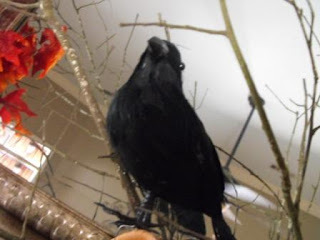 I bought a large crow, yesterday. I'm trying to put together a little vignette for the secretary. 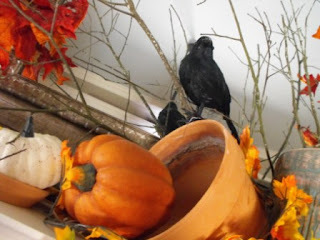 When it gets closer to Hallowe'en I'll post a photo, since it's pretty much a Hallowe'en vignette. I don't do a lot of Hallowe'en decorating, but I always try to have something in the foyer for the kiddos. and I'm sending out prayers to your friends and my friends in Texas!!! I love all the touches you did on your mantle! They are really great...So fallish!! HAH! I knew you could do something beautifully creative with debris. 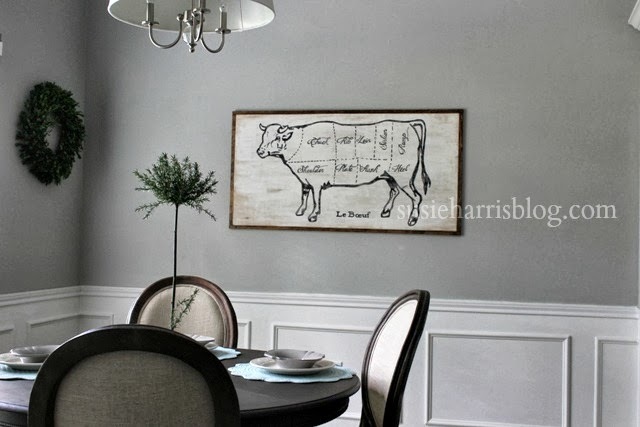 Love the mantel! Very cute! 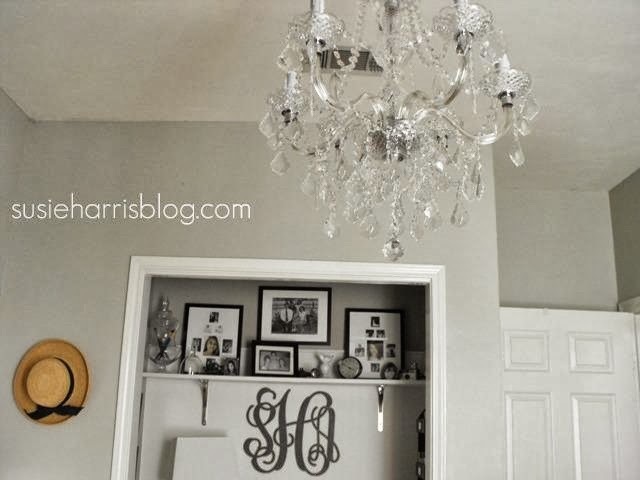 I love what you did with your mirror! I can't wait to link to this idea! It looks so natural--like it's meant to be there! I love it! I love this! 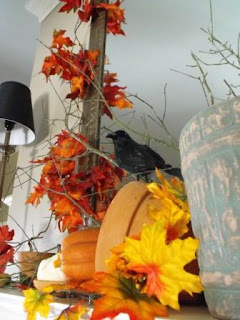 I've got several fall garlands and since moving into this house have had nowhere to put them. This gives me lots of inspiration! Super cute! I love the bird! I talk about you like you are my best friend. My hubby even knows what I am talking about now when I talk about Susie Harris. All the week of the hurricane I would say "I hope Susie Harris is ok" at first he was like huh? Now I say things like "oh I got this idea from Susie Harris" and he gets it. Thanks for the shout out to the Texans. I do hope and pray all will be ok on the coast. So many people have come here, inland and I hope it is ok for them here too. H Thanks for your kind words yesterday. You are precious/ And you are right...more is better for fall! I love your mantle...the sticks added so much. I agree with some of the others in saying that I wouldn't expect anything else from you. I will be praying for those in Texas. It gets me every. single. time. looks great Susie...Prayers are with those in the path of Ike...I'll be glad when the cain season is over! Wow! Great job with the mantle. It looks beautiful. Isn't it a great feeling to make something beautiful out of little things you find around the house? I will be thinking of Texas. 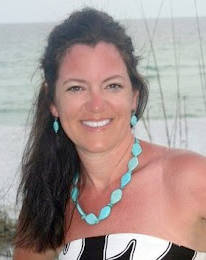 Hi Susie--Well I'm a Louisiana girl here in Houston, awaiting Ike. Yikes! But we are prepared. Love the mantle! As soon as the storm comes through, and the clean up begins, I will put all our fall stuff out as well. Wow Susie, oh my goodness this turned out soooo good. Love it. Yes its fall and that requires lots of leaves everywhere, more leaves, less dusting...yipppeeeee! Thought I'd stop by quick in between packing & last minute trip to WM. Your mantel looks so good Girlfriend! I love it! Sadly no decorating for me till I return... Gonna miss ya! Hopefully I can use the pc @ the hotel to keep up to date. Take care!!! Susie...found you right before Gustav and was happy you/family were alright. Well, I am sitting here on the north edge of Houston hoping Ike will go away but where would I send him? Guess we are finally at the front of the line, been 25 years since we had one. Just hate to lose power, hot and no internet, yuck!! Keeping the faith! Hi Susie, I love the mantle. You really did a great job. I recently found your blog and now find myself reading regularly. Love the mantle. Love it! We're on the NW area of Houston too and it seems so strange waiting. It's definitely the calm before the storm. I'll add your friends to my list of prayers. Sure will say prayers for Texas residents and all of us in the US! If Ike hits the oil refinery our whole nation will suffer!!! A neighbor who is big in the oil industry says if Ike hits the refinery we could all be without gas for months. So go get some gas while you can & start praying!!! ok i love that. i really need some help. those are great ideas. Now you got me in the mood for fall! YES, praying for Texas and the storm! I love this idea!! You are so creative!! I acutally LOVE it! I dont think less is more in this case! And I am so glad your back and ok after the hurriane! Now I am going to leave for a few days because Ike is said to hit us tonight :( Please pray for us!! 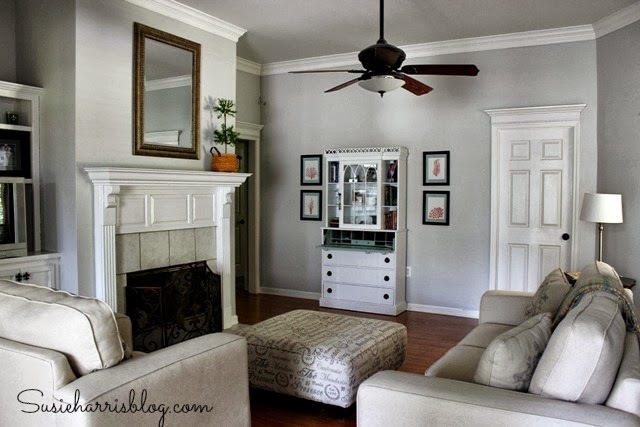 Love, love, love your mantel! We are most definitely praying for all those in Texas. They evacuated our area in Portland yesterday so we are in San Antonio. Since then they have rescinded the evacuation, but we plan to just stay put till Sunday. Glad you're safe and sound. Will add my prayers to the rest. Please keep us in your prayers - Hurricane Ike is headed straight over our farm. We expect a rocky few days with all of our animals. I will try and keep my blog updated. So glad you are back blogging. I have lots of special friends in the path, so many prayers here from NC. 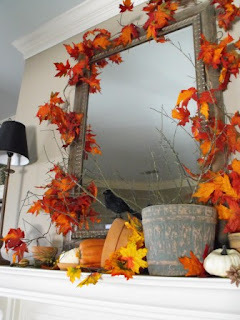 Gorgeous fall mantle! I will keep you in my thoughts and prayers! Hi Susie--Love your mantle---it is so sweet to include something that belong to your maw maw, memories in our heart, we can share by using something of the person or persons we want to remember. I'm sure this would make her smile. Pray for our Texas, friends--working on my papers to go to Longview to work in the shelter there. Those people will need help. The first reponse medical team that I work with went to Biloxi, Ms after Katrina. It was hard, no water, no ac, could not flush the toilets, no showers and it was so hot I cut my scrubs off above the knee. Special needs people sleeping in the halls. People that lost everything, even the cloths on the their back. Very hard to see this loss. Your mantel is quite lovely. I love the eclectic/back to nature look of it. What a great idea for all of our downed limbs! The mantel is PERFECT, I love it!! I can't even imagine you have a hard time ever decorating!